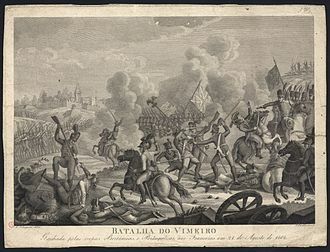 The Battle of Valmaseda (or Balmaseda) took place on 5 November 1808, during Lieutenant-General Blake's retreat from superior French armies in northern Spain. Reinforced by veteran regular infantry from General La Romana's Division of the North (Spanish: Division del Norte), Blake's force suddenly turned on its pursuers and ambushed General Victor's errant vanguard under Général de division Villatte. 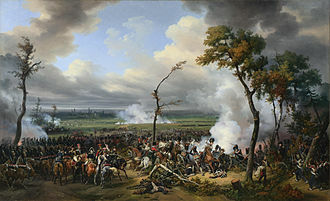 The French defeat had its roots in Marshal François Lefebvre's earlier failure to destroy the Spanish army at the Battle of Pancorbo, where Blake had shaken off the premature French assault and escaped with his army intact. 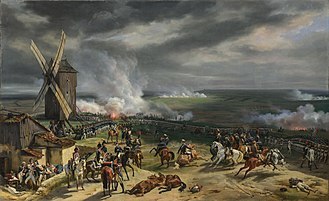 Further mistakes were made in the French pursuit, namely when Victor carelessly allowed his Army Corps to spread out in its search for an enemy he regarded as beaten. 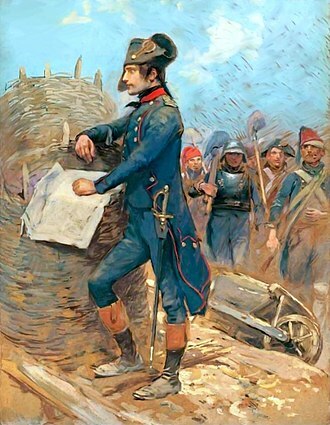 Major-General Eugene-Casimir Villatte commanded the 3rd Division of Lefebvre's IV Corps. This oversized unit included three battalions each of the 27th Light, 63rd, 94th and 95th Line Infantry Regiments, plus two foot artillery batteries. Blake's Army of Galicia contained five infantry divisions, a vanguard and a reserve. 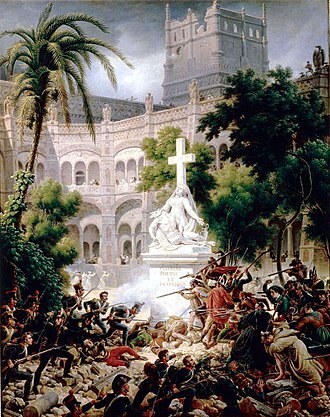 General Figueroa commanded the 1st Division [Hibernia, Santiago, Mallorca, Mandoñedo, Rey]. Gen Martinengo the 2nd Division [Segovia, Victoria, Voluntarios de Navarra, Pontevedra] (5,100)(7 Battalions). Gen Riquelme the 3rd Division [Compostela, Gerona, Sevilla, 6th Marina](7 Battalions). Gen Carbajal the 4th Division [Granaderos](10 Battalions, 1 present). Gen La Romana the 5th Division [Barcelona, 1st Cataluña, 1st & 2nd Zamora, Princesa] (5,300)(7 Battalions). 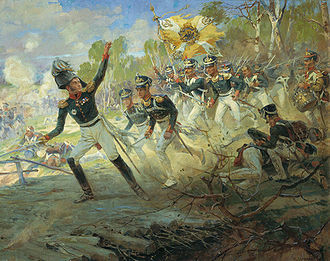 Gen Mahy the reserve [Granaderos, Battalion de General, Corona, Galica, Guardas Nacionales de Galica] (5 Battalions). Asturian Division [Conges de Tineo, Salas, Siero, Villivicioa, Lena, Oviedo, Castropol] (10 Battalions). There were 1,000 gunners manning 38 cannon and only 300 cavalry. Victor tried to trap Gen Acevedo's Asturian Division, which had separated from Blake's army. Instead, Blake was able to draw the French into a trap of his own, and on 5 November Villatte's division, operating ahead of the other French formations, blundered into a brusque attack. 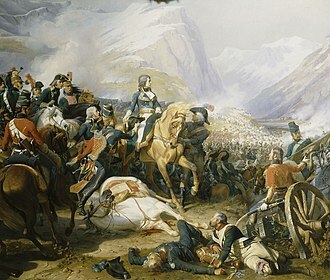 This attack drove the French out of Valmaseda. But while their leaders had erred badly, the iron discipline of the French soldiers did not fail them. 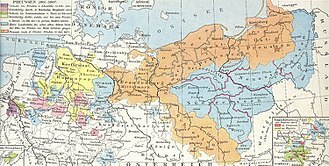 Villatte, refusing to surrender, formed his troops into squares and managed to claw his way out of the Spanish encirclement. Even so, the Spaniards captured 300 men and one gun. During the French retreat, Acevedo's errant division bumped into Villatte's baggage train and captured most of it. On 8 November a resurgent Victor recaptured Valmaseda, killing and wounding 150 and capturing 600 men from Blake's rearguard. 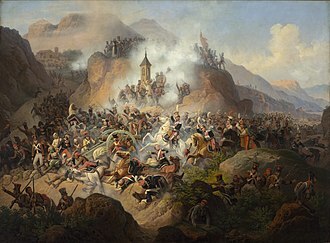 Upon learning of the battle, Napoleon, shocked that his Grande Armée should suffer even a minor defeat by "an army of bandits led by monks," severely reprimanded Victor for his imprudence. 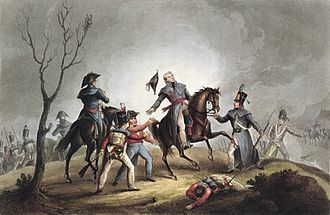 Victor redeemed himself two weeks later when he finally defeated Blake at the Battle of Espinosa. ^ Smith, pp 268–269. French and Spanish orders of battle. ^ Colonel Lipscombe, Nick (2014). The Peninsular War Atlas (Revised). London: Osprey Publishing. 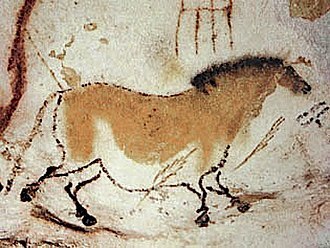 p. 73. ISBN 9781472807731. The Battle of Cardadeu on 16 December 1808 saw an Imperial French corps led by Laurent Gouvion Saint-Cyr assault a Spanish force commanded by Juan Miguel de Vives y Feliu and Theodor von Reding. 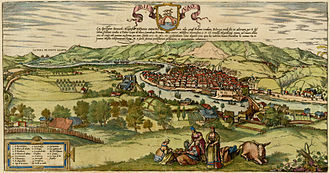 Saint-Cyr won the engagement by forming most of his troops into gigantic attack columns, Cardedeu is located 17 kilometres northeast of Barcelona, Spain. 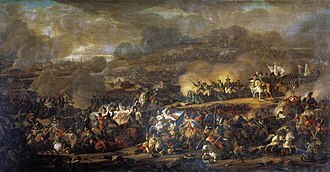 The action occurred during the Peninsular War, part of the Napoleonic Wars, by the fall of 1808, a French corps under Guillaume Philibert Duhesme was besieged in Barcelona by a 24, 000-man Spanish army led by Vives. With 23,000 Franco-Italian soldiers, Gouvion Saint-Cyr marched from France to relieve Duhesmes troops, first Saint-Cyr undertook the successful Siege of Roses. Confronted by the fortress of Girona, which had resisted two earlier attacks, the French general resorted to a risky strategy, leaving his artillery and most of his supplies behind, he avoided Girona by marching 16,500 men though the mountains and headed for Barcelona. 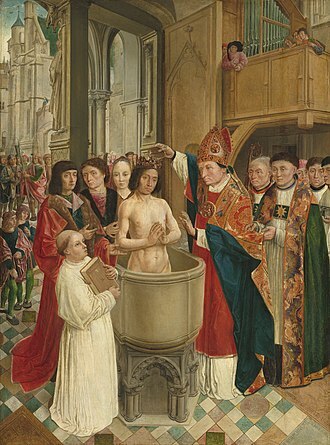 Saint-Cyr completely outgeneraled Vives, who was able to marshal 9,000 troops to block his opponent. 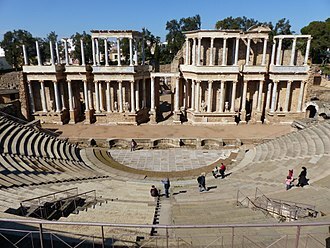 Vives drew up his troops on high ground, but Saint-Cyrs huge columns proved unstoppable. The Spanish withdrew after suffering losses and Barcelona was soon relieved. 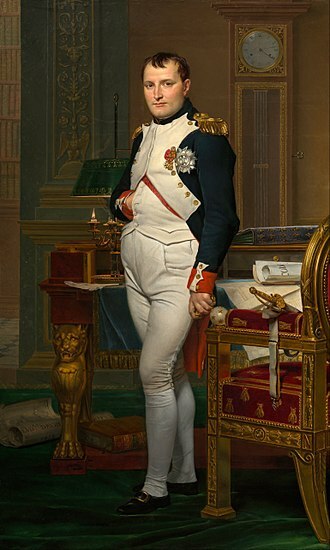 As part of Emperor Napoleons plan to seize the Kingdom of Spain in a coup, several key points. 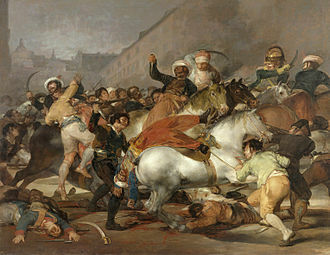 Among other strong places, the French seized San Sebastián, Pamplona, on 2 May 1808, the Spanish people revolted against the Imperial French occupation in the Dos de Mayo Uprising. 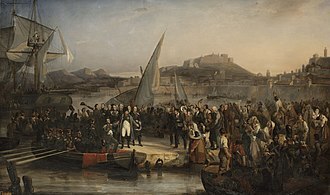 In the early summer of 1808, a 12, 710-man French corps commanded by General of Division Guillaume Philibert Duhesme was stationed at Barcelona. 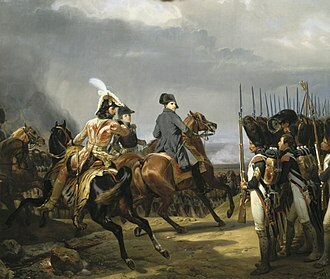 General of Division Joseph Chabrans 1st Division had 6,050 soldiers in eight battalions, the 1,700 cavalry were organized in nine squadrons under Generals of Brigade Bertrand Bessières and François Xavier de Schwarz. 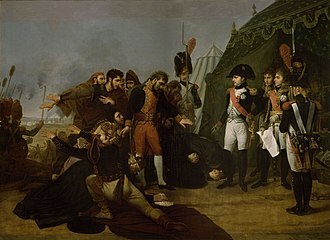 This modest-sized corps was instructed to put down the insurrection in Catalonia, to send assistance to Marshal Bon-Adrien Jeannot de Moncey in his attempt to capture Valencia, considering the intensity of the rebellion, these orders were unrealistic. 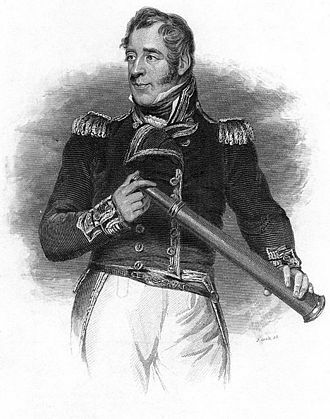 Don Pedro Caro y Sureda, 3rd Marquis of la Romana was a Spanish general of the Peninsular War. 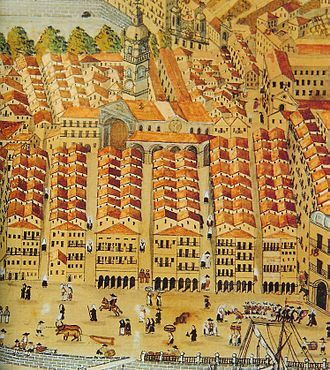 Born at Palma de Mallorca to a family of Balearic nobility, Romana was educated in France and and he studied at the University of Salamanca and entered the Seminario de Nobles in Madrid. 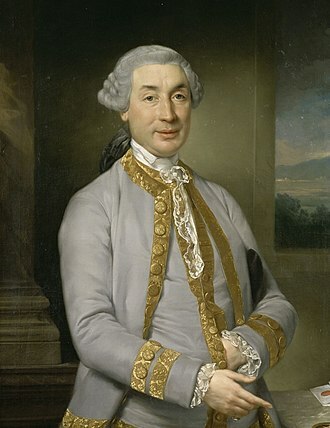 Like many Spanish officers of the Napoleonic era, Romana served in the American Revolutionary War in his youth, in 1783, he participated in the reconquest of Minorca from the British. In the final months of the war, he was assigned to the blockade of Gibraltar, Romana retired from the military after the war and began travelling Europe. Evidence suggests he was dispatched on missions of diplomacy or espionage. 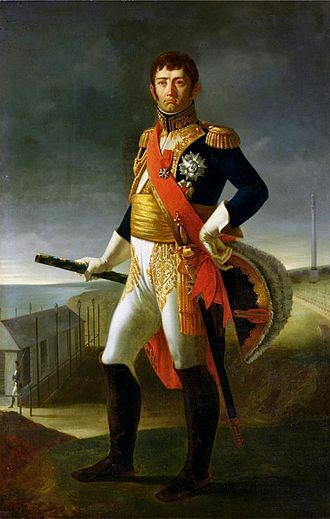 In 1793, Romana entered the army as a cavalry colonel, initially he served under his uncle, General Ventura Caro, where he was promoted after distinguishing himself as a competent commander. 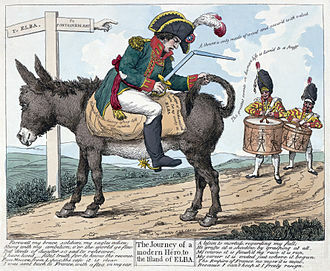 Although the war ended poorly for Spain under French occupation, he ended the war as a teniente-general and he was made Captain General of Catalonia in 1802 and Chief of the Engineering Corps in 1805. 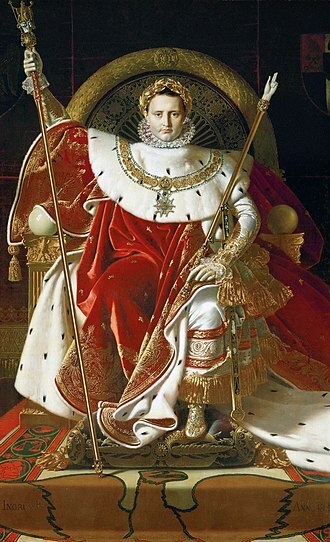 King Charles IV, bullied and pressured by Napoleon, agreed in 1807 to provide an infantry division to bolster the French army in Germany. 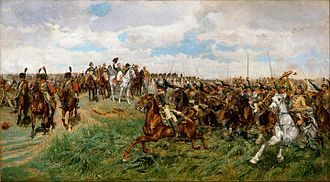 Romana was made commander of this Division of the North and spent 1807 and 1808 performing garrison duties in Hamburg, when the Peninsular War broke out, La Romana made plans with the British to repatriate his men to Spain. The success of the evacuation of the La Romana Division was chiefly credited to his subterfuge, at least 9,000 men of the 15, 000-strong division were immediately able to board British ships on 27 August and escape to Spain. 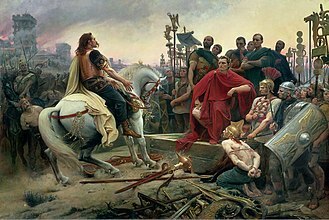 Romana arrived at Santander on the Cantabrian front and received command of the Army of Galicia on 11 November, fate was crueler to him than he deserved, as this army, under General Blake, was destroyed in battle that same day. On 26 November, La Romana assumed effective command of what remained of the army –6,000 men all told, with this force, he fought some rearguard actions for General Moores retreat westwards to Corunna. Soults cavalry under Jean Baptiste Marie Franceschi-Delonne overran la Romanas rear guard led by General Martinengo. 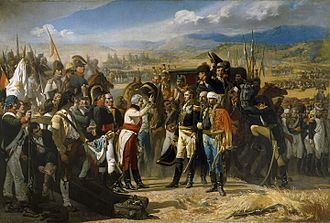 Mansilla de las Mulas is a town located 17 kilometres southeast of León, the combat occurred during the Peninsular War, part of the Napoleonic Wars. La Romanas Spanish corps cooperated with Sir John Moores British army in its advance into northern Spain and in its subsequent retreat to the northwest, at Mansilla de las Mulas on the Esla River, the Spanish commander posted Martinengos division to hold off Soults pursuing French corps. The rear guard commander unwisely drew up his soldiers with the bridge at their backs, franceschis cavalry charged and cut the Spanish formation to pieces. Half of the guard were trapped against the river and forced to surrender. La Romana abandoned León the following day, the next major action in the area was the Battle of Corunna on 16 January 1809. 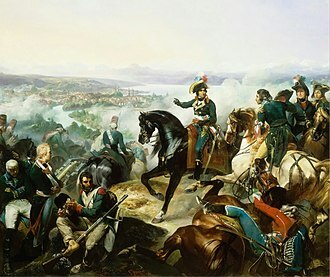 Franceschis 2,200 horsemen included the French 8th Dragoon Regiment, the 22nd and 1st Provisional Chasseurs a Cheval Regiments, the 3,000 men and two cannons of Martinengos 2nd Division of the Army of Galicia belonged to a mix of regular and militia battalions. 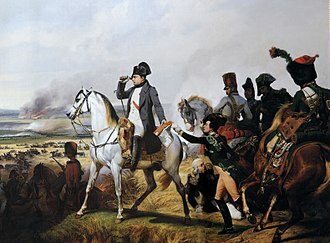 General Gouvion-Saint-Cyr at the battle of Molins de Rei, 21 December 1808.